Wear an undershirt – All during school and the first 5 years of my professional career, I didn’t know about the wonders of undershirts. My shirts were tight as it was, so I couldn’t imagine slipping another layer of fabric underneath. Plus I thought undershirts would just make me sweat more. Wrong on all accounts. After a brutally hot summer where I was the only one with sweat marks in the group of guys, I found out the others wore undershirts. The undershirt soaks up sweat and body oils before they get to your dress shirt, thus extending the life of your shirt. I just get a half-size larger of dress shirt, which is more comfortable anyway. Change into casual clothes when you get home – As soon as I get home from work, I change into shorts, sweats or jeans, depending on the season and time of day. Nothing will wear down your clothes faster than, uh, you wearing them. Only wear your business attire when you’re at work. Obviously this means you should take off your loafers when you mow the lawn too. Hang and button your shirts – You can get more than one wear between washings on your shirts as long as you hang them rather than throw them into a pile. Also button them up to the neck to keep the collars from sagging. Hang your pants with inside seams touching – If you go into a department store, you’ll see all the pants are hanging “sideways”. The seams along the insides of the legs are lined up and touching so that the creases in the front and rear stay bent. If you can’t picture this, go to a clothing store to see for yourself.
. You’ll definetly want to get some of these for your wardrobe. Untie your tie – For men, keeping your tie in a knot may make getting dressed a minute or two faster, but it will kill the life of your tie. Untie the tie and hang it on a hanger or tie rack to let the fabric return to its “natural” shape between wearings. Don’t over-wash your clothes – The chemicals from your laundry or dry cleaner slowly wear away the fabric, while also cleaning it. If you wash your clothes after only one wear, not only are you contributing to harmful cleaners entering the environment, but you’re also keeping the “per wear” cost of your clothing high. If you’re just sitting in an office all day, and wear an undershirt, you can re-wear your dress shirts for at least 2-4 times in the winter (given you’re following all the tips above). The same can go for pants, but be wary that you’re sitting on your bum all day and might be sweating in your pants without feeling warm elsewhere. These are just a few of my own tips, but I’m sure you have your own as well. One tip I also follow, but wasn’t sure about adding to the list, is to dry clean/launder your shirts and pants, rather than washing them yourself. I’ve found that my clothes come back from the dry cleaner much nicer than I could ever get them at home. And for a few bucks a month (I re-wear my clothes), I personally think it’s worth the extra cost. But I also use a discount dry cleaner. How about you? What tips do you follow to keep your work clothes looking fresh and crisp? Or do you just throw them in a pile and let them soak up stink for weeks before washing them? I normally hang my pants using the method that you described. I never thought about buttoning my shirts to save the collars. What a great idea! I only wear my shirts once (I am a girl and don’t wear undershirts…and I sweat a lot) but wear pants more than once. I wash every weekend so my clothes only get to ‘soak up stink’ for about 7 days. I change as soon as I get home and hang up the stuff I was wearing to air out before throwing it in the laundry. I don’t put my clothes the dryer….I hang everything up to air dry and this means less ironing as well. @Lulugal, definitely true about not drying clothes, but as you know, you need to get them out of the washer ASAP to avoid mildew growing. Getting one of those wooden/plastic drying racks is a great buy and my wife uses one for her bras, sweaters, camisoles, etc. I have to wear a suit every day so your tips definitely resonate with me. Just a few additions/comments. Do not have shirts starched One that you hint at, though don’t say outright, is that when you have your shirts professionally laundered, do not have starch added to the shirt. Beyond the fact it makes the shirt too ‘crisp’, the chemicals in starch break down the fabric faster and your shirts do not last as long. Although suits are truly dry cleaned, shirts are merely laundered and pressed. Although people often talk about getting their shirts “dry cleaned”, it is just a colloquial word use for laundered/pressed. Only dry clean suits a few times a year People tend to over-dry clean their suits, mainly due to wrinkling. If folks follow your very good advice of hanging your suit immediately at the end of the day, with the pants folded on the inside seams touching, wrinkling will be minimized. At work, I only have to wear the jacked of the suit if I have a meeting or am in court (I am an attorney). Otherwise, I have them hanging on a nice thick cedar hanger on the back of my door (cedar hangers help with absorbing perspiration and the large hangers allow the suit, as mentioned, to keep its shape, again reducing dry cleaning needs). Alternate dress shoes Although you did not mention shoes, I have great increased the longevity of mine by simply alternating the two pair I have, using cedar shoe trees after each use. Weather it is a hot or cold day, your feet will perspire, and as it drys outs in your shoes, it can warp the shape as well as make the leather crack. By using cedar shoe trees (like with suits), it will absord the moisture away better than just evaporation, and the wood will force the leather to keep its good shape. By alternating (amoung 2, 3, 4 or even more pairs), you give the cedar tree time to do its job. Avoid wearing the same pair two or more days in a row. If you ever get caught in bad rain with your shoes, stuffing them with newspaper as quickly as possible after getting out of the rain will help with getting the moisture out of the shoes, be sure to use the shoe horns right after the newspaper. Shine your shoes regularly Another thing with shoes to make them last, on top of alternating and using cedar shoe trees, is making sure you regularly shine or shoes (or have them shined). Cedar will only slow the evaporation of the needed moisture in a shoe; shining them will restore it. I have ruined prior pairs because I was not diligent in keeping them shined. If you alternate, even among just two pairs, once a month will be OK, but more often is recommended. I did ask for starch, but then found I didn’t like the spotty sheens on my shirt from bad starch applications, plus the weird smell, so I stopped. 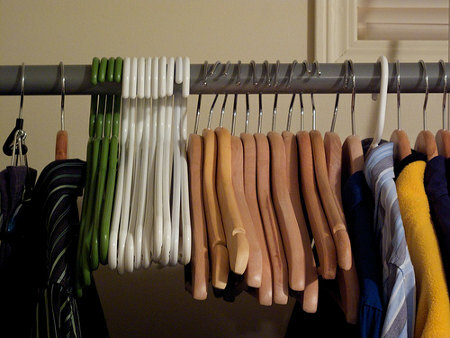 Sure, the shirts are nice and stiff on the hangers when you pick them up, but it’s not worth the reduced life of the shirts overall. And you’re right about the laundering vs dry cleaning. I only wear suit coats for weddings and interviews. Surprisingly, I’ve never cleaned my suit coat since buying it 9 years ago. However, as with you, I don’t wear it unless I absolutely need to. It’s hanging up when I’m not. I leave my black dress shoes at work and wear black sneakers home (like a modern day Mr. Rogers), but I do alternate with maroon leather shoes. Also, I only get shoes with rubber soles, so moisture doesn’t affect them like they do with leather-soled shoes. They’re not as fancy-looking, but they get the job done. But you’re right about getting them dried out. The summertime walks home from the metro are killers for my shoes. As for shining, I’m very negligent. I keep saying “Oh man, I need to shine these things”, but then I forget about it when I get home. We have a shoe shine downstairs, but I’ve never used one and don’t know how much they cost. I’ve shined my shoes before, and it’s not hard. Thanks for reminding me. Mase March is right on with his tips. Starch is bad, if you absolutely must have it, then get your shirts on the hanger and ask for light starch. Cleaners can adjust the amount they put on if you ask. One thing I would say is LEARN TO IRON. Hand finishing a shirt with an iron means you can save money by washing it at home. My mom had laundry service at her dry cleaning shop for many years. The thing that separates professionally cleaned shirts from home washing is the ironing job. Even with a steam press, some things, like shoulders, come out better with hand ironing. Also, you can have a suit freshened with ‘press only’ at most dry cleaners. If all you want is the nice finish, then just ask for that. Final thing to add is to wash suits with all pieces together, whether or not you think all the pieces need it. It keeps one piece from getting faded compared to the rest of the suit. Sounds weird, but when you keep a classic cut suit for 10 yrs, it will get out of synch. Wow, you must not sweat at all! Even with an undershirt, and sitting in an office all day, I sweat enough that upon a second wearing the underarms would be ‘re-activated’ into smelling. My rule is that if I wear a shirt for about 4-6 hours maybe for a weekend outing, then I can wear it again, but not one that I’ve worn for 10 hours. I wear all my business clothes at least twice before washing/cleaning/ laundering – whatever. I buy classic pieces that will be wearable just about forever. For sweaters, those “do it yourself” dry cleaning kits (like Dry Cleaner’s Secret) are great – after a few wearings, I toss 4 or 5 sweaters into the dryer with one of those things and after 20 minutes on medium, they are freshened, and look like I spent $5 a piece to have them cleaned! I follow the same rule on casual clothes – if I only wear something for a few hours, I hang it up, air it out and then put it in the closet. Yeah, I have to kind of keep track of what I’ve worn and when it needs to be washed, but I don’t have so many clothes that it would become confusing. A lot of my shirts are 15+ years old and are in fantastic condition. My only suggestion would be to add keeping up on tiny repairs. If you notice a pulled stich in a sweater, or a loose button, or a droopping hem, fix it while it’s small. It’s always easier to make a tiny repair than to let it turn into either a big repair or something that could destroy a garment completely. Great, great tips! I especially like the idea of keeping your shirt hung on proper hangers and hanging your parents the correct way. i like ’em! and i agree – a cple dollars to get your shirts cleaned professionally is WELL worth it. Another more recent idea could be to get one of those air vacuums that you see on infomercials. It’s supposed to take all the air out not only creating more closet space, but helps out with preserving the clothes because of the lack of air. I don’t dry clean my work clothes because I think it’s unnecessary. As Mase says, they’re just laundering and pressing them. I can do that at home. I wash in the gentle cycle with woolite on my work clothes and air dry the majority of them. There are some I find it’s just better to hang dry, but usually a light round in the dryer is alright. But, as a girl, I’m with lulugal here. We don’t have the advantage of an undershirt in most cases, though I suppose if we’re wearing a dress, we could wear a slip. I probably wouldn’t though. I’m actually terrible about this, though. I tend to be the one that throws my clothes in the hamper when I take them off. I do reuse pants, unless it was an extra hot day and the thought grosses me out. But, as a general rule, I do laundry once a week and anything I wear gets tossed into the hamper. Nice tips, though. If I were a guy and my wardrobe was a little less complicated, I’d totally follow these! Those are good tips that everyone needs especially during these times of financial distress. I like the additional tip you gave on using a dry cleaning place but it sounded like you made it more affordable by using a discount dry cleaner. There are coupons too in the newspaper you can use. A lawyer friend of mine has a steamer that he uses to knock the wrinkles out of dress shirts, jackets, pants, etc. He said it is the best investment he ever made. Saves him lots of money since he does not need to launder/dry clean as often. I really agree with the wearing an undershirt comment. Have been doing this for a year now and it really does soak up all the body oils, which does lengthen the life of the shirt. Other tips are quality too. I would like to add air dry your clothes on a laundry drying rack or clothesline. They will last much longer since the heat of the dryer is very hard on most fabrics. Not to mention dryers often shrink many clothes that fit perfect while you were at the store. Thank you for these tips. I recently upgraded my wardrobe and have been wearing business attire all the time. As a graduate student, I appreciatye the tips to save money and extend the life of my clothes. Also, it seems that I’ve been doing a few things the hard way. Thanks again. I usually don’t wear an undershirt all the time when I wear my shirts because it doesn’t feel super comfortable. Usually on a hot hot day I would wear an undershirt so then my shirt wont get so spoiled with sweat. It’s easier to wash my whites because I just have to put some oxy bleach and hot or cold water with some detergent, and they come out super white and really clean 🙂 I usually wear my dress pants once if it’s really hot and I’m sweating like crazy or twice if I’m not sweating like crazy. Women, ALWAYS hang your fine washables to dry. Never put them in the dryer as the elastic becomes brittle over time and hooks & latches catch on clothing in the dryer. A secret my mother taught me, iron your silk items with a cool iron while still wet, taken directly from the washer. The moisture gives an unbelievably smooth press job. Men, don’t “hang” your best neckties. Gently roll them – large end on the outside – into a large, soft bundle and store in a drawer. Residual detergent, over-starching and machine-drying destroys fine dress shirts. NEVER wash in an agitator-type washer!!! Buy a front-loader – better than hand-washing! Use a white-vinegar final rinse – and spot-spray the collars, cuffs and chest area of dress shirts. ALWAYS iron them damp and never use a thin wire hanger. Take good care of the fine dress items that you can on your own. If you don’t know how to – or don’t want to, then you shouldn’t have bought them!